do you want to Set Up a Zero Waste Store? 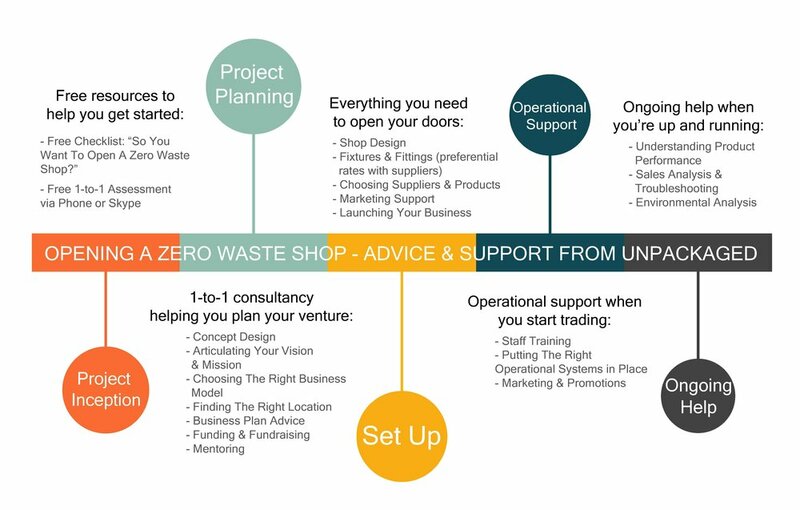 Group workshop in London designed as a comprehensive overview of everything you need to run a zero-waste shop or a small zero-waste section within an existing store; more info & book here. 1:1 consultancy helping you plan your venture: concept design, business models, financing, location advice. Everything you need to open and start trading: shop design, preferential rates for equipment, fixtures & fittings, suppliers & products, operational plan. Ongoing support when you’re up and running: staff training, marketing & promotions, sales analysis & troubleshooting. Access to our network: as the pioneer of zero waste retailing, we have developed an extensive network of contacts that we can share to make your business a real, sustainable, success. 2- an email with a link to the checklist. In November 2016 I opened Sweden’s first package-free shop and Catherine helped us during the set-up phase. She has a wealth of information and experience about working with bulk concepts. She is realistic and open about the problems you might encounter, which was really important. She was encouraging and supportive and is passionate about the importance of zero waste shops. I highly recommend you talk to her if you want knowledge from one of the most experienced people in the bulk-shop world.